The Money app in Windows 10 offers opportunities to research financial markets, investment opportunities, and much else pertaining to the root of all evil — money. Select the Money app on the Start screen. Select the Show Options button to display the option names on the app bar. Select Markets on the app bar to go to the Markets screen and get a summary of recent activity in the world’s leading stock markets. Select Watchlist on the app bar to open the Watchlist screen, as shown in the preceding figure, middle. From here, you can maintain a list of stocks, bonds, and mutual funds to track their performance. On the Watchlist screen, select Add a Favorite (the plus sign). On the Add to Watchlist screen (see the bottom image in the preceding figure), type the ticker symbol or name of the security you want to track, and then select an option from the list that appears. The stock, bond, or fund you select is added to the watchlist, and you return to the Watchlist screen. To investigate the performance of a security, select its name in the Watchlist (select the name of the security you’re most interested in). A screen similar to the one shown opens. From here, you can take a hard look at the security to see whether it’s worth keeping or investing in. Select the Pin to Start button. Selecting this button places a tile for this security on the Start screen. 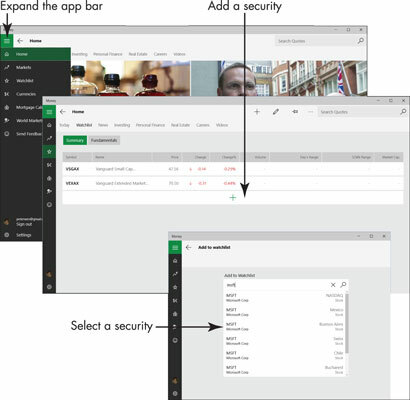 Open the Start screen now and look for the security you just “pinned.” You can click the security’s tile to open Money to the screen where the security’s performance is tracked. 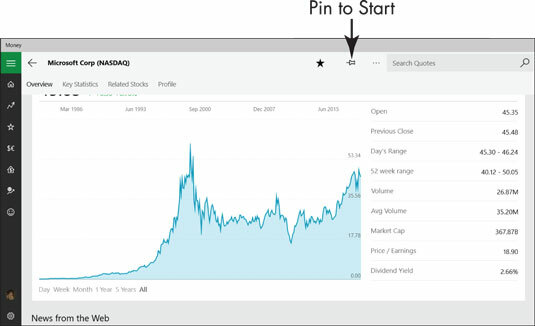 Pin a security to the Start screen when you’re keen to know how it’s performing. To remove a security from the Start screen, return to the screen in Money where it is tracked and select the Unpin from Start button. Close the Money app (or rummage around a while longer to see what else it has to offer).